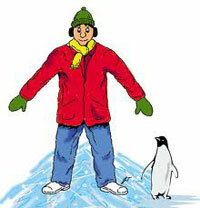 Walking like a penguin is recommended on snow and ice. Walk like a penguin. Take a lot of small, slow, shuffling steps and point your feet out slightly like a penguin. Spreading your feet while walking on ice increases your center of gravity. Wearing treaded boots also is helpful. Bend slightly and walk flat-footed, with your weight directly over your feet as much as possible. Look ahead when you walk and extend your arms out to your sides to maintain balance. Wear warm gloves so you can keep your hands out of your pockets. That way, you can use your hands to break your fall if you do slip. It also helps to stop occasionally to break your momentum. Don't rush. Plan ahead and give yourself enough time to get where you want to go. For more information, review this fact sheet. We encourage everyone to discuss these and other safety concerns at staff meetings, in work groups and during safety committee meetings. Be sure to report particularly icy conditions that need attention to the UW Physical Plant service desk, call 766-6225 or email svsdesk@uwyo.edu.